Just a few years ago, pioneering surfers stumbled on this location while exploring around Biak Island in Papua. On a particularly remote stretch of rainforest coastline, pristine waves were discovered with no surfers. The break is a perfect A frame; a peak with a right and left barrel. There are nine different set-ups in a 10 km radius, with other breaks yet to be explored. The potential for riding waves with no other surfers is limitless. Papua Adventures can take you to this location from Biak town by chartered automobile. Once at the location, motorbikes will be provided for local transportation to the surfing breaks. While this is not a tourist area, we have secured local accommodation in a house with 4 bedrooms, a spacious dining area and kitchen. Comfortable mattresses and mosquito nets are provided. A local cook will be provided for all meals. Due to its remote location, few surfers will attempt this great adventure. The waves will be free from crowds found elsewhere in Indonesia. Biak Island lies one degree south of the equator in the Pacific Ocean. 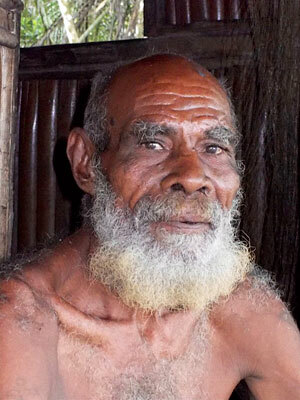 The locals are laid back, friendly, betel nut chewing Papuans. Their hospitality is heartwarming. You will make friends here to remember. Biak is famous for it€™s fire walking over red-hot stones. This is currently practiced in certain villages. Between surfing, many activities are available such as snorkeling on coral reefs, jungle trekking and exploring pristine rain forest waterfalls. In the effort of controlling the flow of tourists, this tour will be limited to 5 persons per trip with a minimum of 2 people to run a trip. 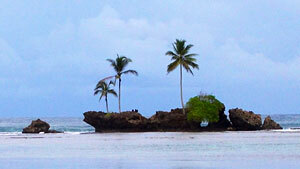 10 DAY BIAK AND SUPIORI ISLAND SURFING ADVENTURE. Arrive in Biak, Papua in the early morning. Chartered ground transportation will pick you up at the airport and directly proceed to the village that will be your surfing base camp. After a 3-4 hour drive you'll arrive in the village. Accommodation will be in a local house. You will have your own private room. There is electricity in the village. Sleeping mattress, sheets, pillows and mosquito nets are provided. A cook will prepare 3 meals a day. Vegetarian meals can be provided upon request. Plus a local guide who is familiar with all the surf breaks in the area. For local transportation we have motorbikes with surf board racks attached to the side. A local guide will collect your passports and make your travel permit at the police station. The next day he'll return your passports with the travel permit. Enjoy the many surfing spots. Other activities in the area include; coral reefs for snorkeling, and jungle trekking to see exotic birds, parrots, possibly birds of paradise and a beautiful rain forest waterfall. The morning will be spent surfing and in the afternoon your chartered ground transportation will take you back to Biak town. Accommodation will be in medium priced hotel. Catch your flight back to your original destination in Indonesia. The tour will be concluded. Minimum of 2 persons to run a trip.